05 Jan 2011 - Part II: This is a continuation post of 3D Conveno Kiosk launched for Changi General Hospital below. To provide a integrated hospitality experience to visitors, G Element has also launched the Conveno Mobile web app for Changi General Hospital. With Conveno Mobile, visitors are able to easily find out, on the move, the facilities and clinics that are available at the hospital. Using the 3D View, visitors are able to familiarise and orientate themselves with the interior environment at his/her intended destination. Like the 3D Conveno Kiosk solution, the Conveno Mobile app also finds and recommends the best way for the visitor to reach his/her destination. In addition to path display, visitors are able to use the realistic step-by-step guide to navigate to their destination. 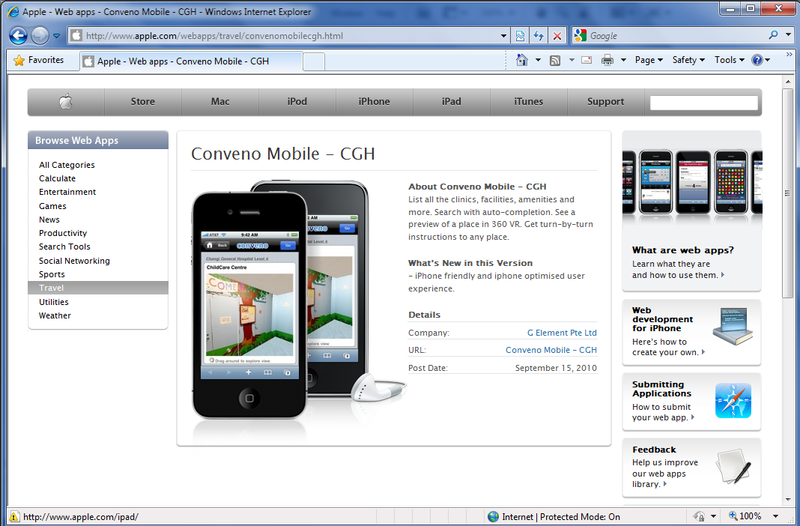 Conveno Mobile for Changi General Hospital is available here at the Apple Web App Store. You can also point your iPhone browser to the url m.conveno.com/?v=cgh .